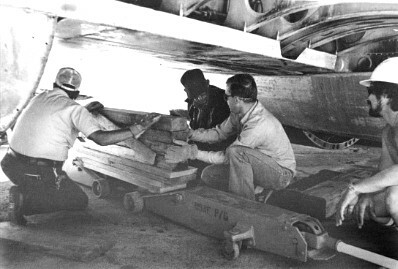 Raising the aircraft onto its tires and landing gear was a dicey operation: it had to be done in one day. 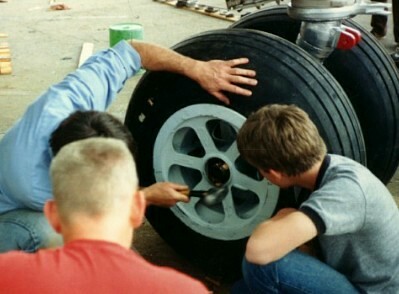 A pair of 5 ton floor jacks joined by some dunnage were able to lift the aircraft enough to lower the gear and install the wheel assemblies. 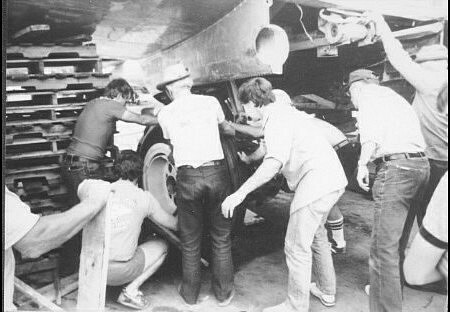 Q: How many guys does it take to change a tire? A: Nine .. one to change the tire, and eight to tell him what he's doing wrong! Pieces of greased wood jammed into the race acted as temporary front wheel bearings until we could find more bearing assemblies. This is a trick Mel showed us from his battle damage work in Vietnam. 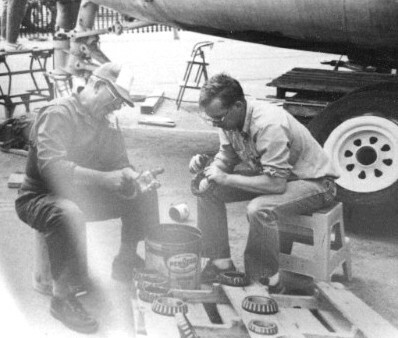 Big John and me, greasing some bearings.